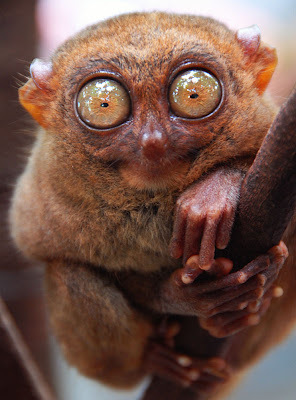 The tarsier's eyes are so large that each bony eye orbit is larger than its brain pan and larger than its stomach (you know the old addage...). Their eyes are fixed in place, but they've got incredible flexibility in their neck (upwards of 300 degree range) which allows them to see in most directions. Unlike most nocturnal animals, the tarsier doesn't have any reflective quality to its retinas Enter those massive eyes again. Huge eyes equals huge pupil dilation equals lots o' light coming in. Curious to see just how large the eye orbits are? Look below. Finally, an animal from my country. I haven't seen these little ones yet, but I heard they're very nice and friendly. See, I think anything with something WAY oversized is cute. Big ears, big eyes, big nose...it just adds to their cute uniqueness. I have a little skull collection. Maybe I'll snap some pictures and e-mail them to rangingwombat. 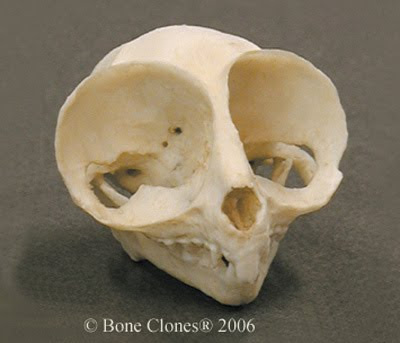 Nature is just WEIRDER than I could make up -- I would never have thought to see something like that skull, outside of a cartoon!